"KIJK EENS IN DE POPPETJES VAN MIJN OGEN"
When I meet new people, I'm always fascinated by two things. Fortunately, I usually choose to concentrate on the first thing !! 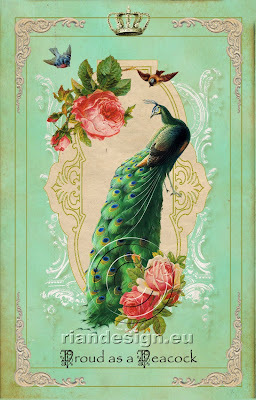 And my second piece, a whimsical vintage card. All the rest is personal or/and selfmade. Wow Rian, this is gorgeous. Love the EYE. Marvelous colors and composition. The second one is also beautiful with the peacock. A beautiful eye full of rich color and sense of excitement- both are lovely pieces Rian! love them both!! just fabulous!!! oh schitterend oog en dan die groene gloed op dat gezicht. Now that is 'eye-popping' Rian! Love your style!! Both so different, so eye popping!! I L O V E your eye piece, Rian! Absolutely gorgeous. Both pieces are lovely. The eye is brilliant! Rian what can I say ?? This is facinating and phenomenal. Both pieces of art are beautiful ! Thanks for turning off word verification. I despise it. 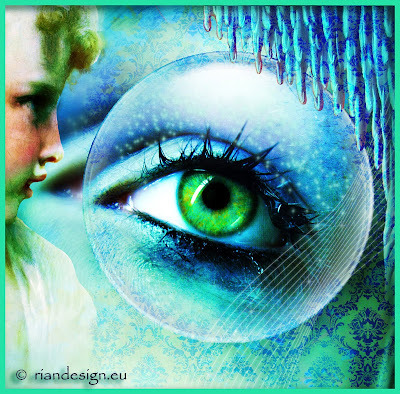 the bright colors of the eye collage are just right up my alley!! Two such different piece, but both fabulous in thier own way. Thanks for pointing out the TaW challenge - I been too busying studying recently to join in, so it's good come back for a week. Yes, the eyes have it, Rian, and this one is gorgeous. I also like the old-fashioned peacock. Both are beautiful, Rian! the first one especially, the colors are so brilliant! Jeetje rondje duurt langer door die stomme codes...niet te lezen. Maar je plaatjes zijn weer top. Now, how strange is that ..... teeth first and then eyes for me. Probably because I want nicer teeth! Anyway enough of that, I'm here to let you know that both your turquoise pieces are gorgeous and the eye one is exquisite!!!! Both are beautiful, Rian. The eye is mesmerizing! wow Rian! ze zijn beide prachtig maar die met het oog is toch wel helemaal geweldig!!! Hoe jij toch altijd op deze dingen komt! Welcome at my place when you want! I think I missed this one. I love the eye. You're right! It's all in the eyes.